At the event, Bond and San Roman won the prize for Best Brief in the Southeastern Region of the competition. 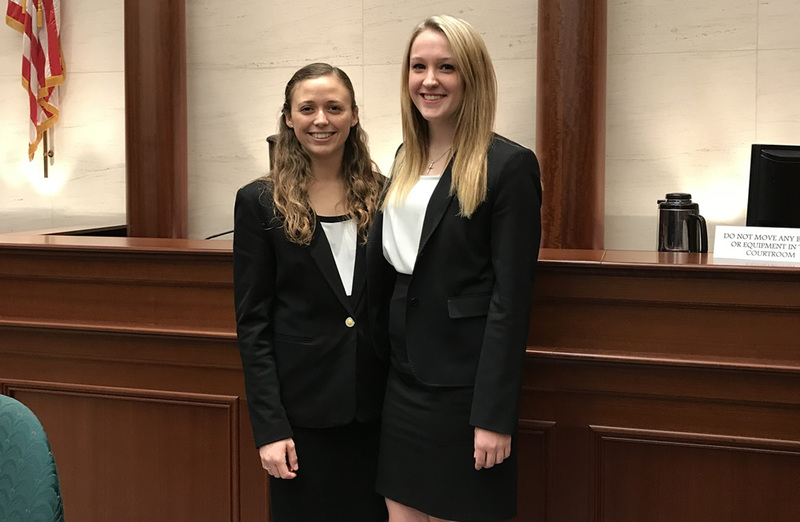 In addition, they advanced to the semifinals of the oral argument portion of the competition, where they narrowly lost to the eventual regional champion. The problem for the competition involved a hypothetical dispute between a university that owned a (fictional) patent for brain-machine interface technology and a licensee who had developed a (fictional) product called the Chat Hat that practiced the patent. The appeal involved two issues – the first was whether federal subject matter jurisdiction existed, and the second was whether the patent was invalid as obvious. The competition, now in its 45th year, is organized by the American Intellectual Property Law Association (AIPLA). Members of the AIPLA served as judges of the competition. W&L law professor Christopher Seaman served as coach for Bond and San Roman.